On July 1st, our club will begin a new year, and this past Saturday, outgoing officers met with the incoming board members to ensure an effective and efficient transition. Outgoing President Sandy Patel opened the meeting with a review of the club’s accomplishments this past year as well as upcoming events and areas subject for improvement. He and incoming President Marc Jacobson led the session that covered the current budget, planning guidelines, board roles and responsibilities, Rotary grants, and the club’s overall 5-year Strategic Vision. This annual meeting allows our leadership to remain strong, engaged, and focused during transition periods, providing a solid foundation as we continue to place “Service Above Self” locally and internationally. Attending Rotarians pictured above are Kris McBride (front); first row: Larry Smith, Shelia Nash-Stevenson, Matt Davis, Marc Jacobson, Pam Blackwell, Sandy Patel; back row: Kimberly Hardee and Gene Pfeiffer. 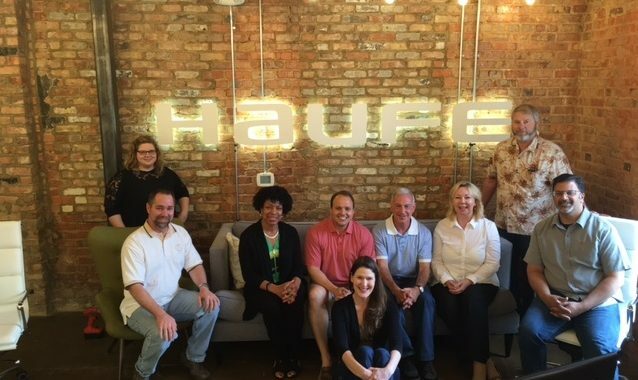 Also, a special thanks goes to Dr. Timo Sandritter the COO of Haufe, Inc., who generously provided his facility for our meeting!